Today’s guest on the AppMasters podcast has sold multiple businesses and founded one of the first text, mobile web and mobile app companies in 2008. 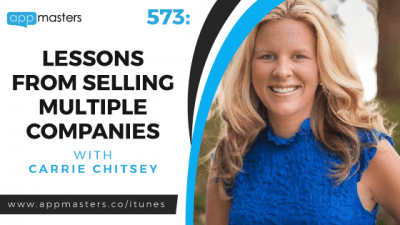 She shares her advice on selling multiple companies, how to detect industry trends, what to avoid when seeking outside investment and how to figure out your selling window. The selling window depends on the industry but regardless of what industry you are in, look at the past. Business-to-consumer trends always follow consumer-to-consumer trends so if you look back at history, you will figure out your window. Create a timeline or a graph so you can figure out when your window is. Carrie has always been a disruptor and she looks at trends and what the more progressive companies in the US are doing. Since she was a kid, she was never a follower so when she started in her first texting company, she knows what’s forthcoming because of her foresight brought about by her observations and connections. That’s why, although she initially received negative feedback, she treaded on fueled by her people skills, her passion for technology and her faith for herself and her vision.